Today is National Get Out Your Guitar Day. This is the day you get out your guitar so that your cat has another place to curl up and take a nap. It wasn’t any surprise, that David Letterman’s iconic ‘Stupid Pet Tricks’ would be sorely missed when he retired a few years back. In some places, no matter how hard you try, a wild animal will get into your house. And I'm not talking about the run of the mill flies or ants. A mug of coffee is a great way to start the day. Another way to start the day is with a huge dose of cute. You can do both at the same time with this adorable and unique Panda Mug. 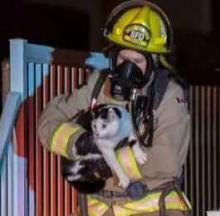 Dalmatians might be great firehouse dogs but for one thankful Canadian family the best pet to have around in case of a fire is a black & white cat. I am all ready to celebrate umbrella day with my umbrella. Too bad it keeps raining. That could ruin the whole thing.